The airport in Nevis is called Vance W. Amory International Airport (SKB). It is located on the northern tip of the island between Oualie Beach and Nisbet Estate. The commercial carriers that operate in and out of Nevis include Cape Air, Winair, Costal Air, Air Sunshine, Seaborne Airlines, Fly Montserrat and Tradewind Aviation. The airport also caters for many private aircraft arriving at this tropical paradise. Many guests arriving from international flights will arrive via the neighbouring island of St Kitts. St Kitts is really well serviced from many international and inter Caribbean destinations. When you exit customs, you will be met by our representative who will greet you with a warm smile and assist with your luggage. If you have time or if you are hungry, there are a couple of really nice restaurants and bars located at Turtle Beach. Reggae Beach Bar and Grill is right beside the dock. It is a wonderfully relaxed very authentically Caribbean spot. Next door is the Spice Mill Restaurant which is also very popular location with the locals on Sunday lunch. They have regular live music. The beach here is lovely and calm and good for a dip if you feel like a cool down before boarding your boat to Nevis. The journey by boat is wonderful. The scenery is breathtaking and takes just about 10 minutes. This area of sea is called The Narrows and is almost always very calm. You will arrive at Oualie Beach where a car will transport you to your villa. Round-trip arrival and departure through St. Kitts is an additional charge. Please enquire with our concierge. If you are staying in one of our villas at the Four Seasons, our concierge will pre arrange your trip to Nevis. Round-trip transfer fees are USD 150 per adult and USD 75 per child ages 6 to 11 (children ages 5 and under receive complimentary transfers). After you exit the customs hall at Robert Bradshaw Airport, you will be met and escorted to your waiting car. From the airport you will take a short 10 minute drive to Port Zante to board the Four Seasons Luxury boat. The boat trip takes approximately 40 minutes. It is a beautiful trip and you will get a chance to see quite a bit of the St Kitts coastline. There are complimentary rum punch, local beer and a selection of non-alcoholic beverages available onboard and will get you in vacation mood. 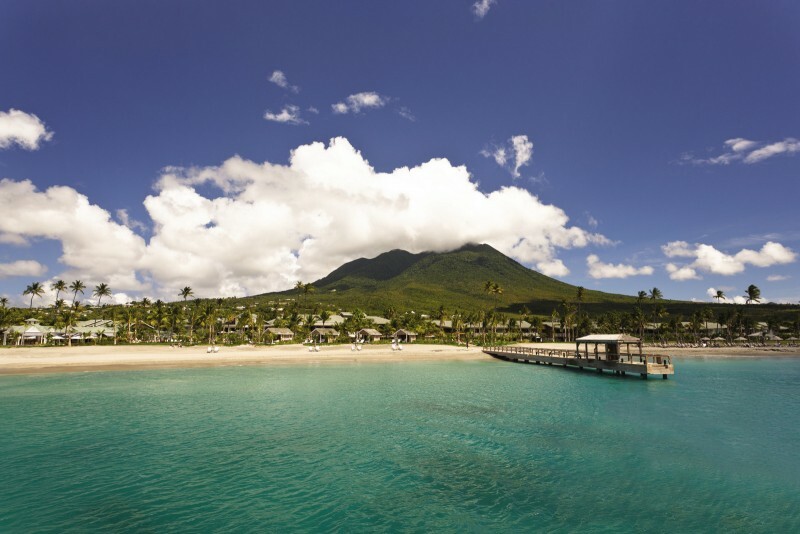 The Four Seasons has its own boat dock so you will arrive directly at the resort in Nevis. The Yu Lounge at St Kitts Robert Bradshaw Airport is a private VIP terminal. It is the perfect place to end you vacation in comfort and style. You will be able to do both check in and security in the lounge area and will be escorted to the aircraft by a private luxury car. Should you wish to avail of this wonderful VIP service, our in house concierge will be delighted to assist.